In case you somehow missed it, Marie Kondo is taking over the world one closet at a time. But what if she turned her attention to tidying up Minnesota's sports teams? In case you somehow missed it, Marie Kondo is taking over the world one closet at a time. Between her book and Netflix show — the latter just came out a few weeks ago and is titled “Tidying Up with Marie Kondo” — her methods of minimalist-inspired decluttering as a means of transforming lives have become very popular. While sort-of watching a couple episodes of her Netflix show and Kondo-ing my overflowing T-shirt drawer last weekend at the urging of my tidying up wife doesn’t qualify me as an expert, it does qualify me as someone who knows just enough to be dangerous. Kondo encourages people to go through their belongings by category instead of by room and to ask themselves if these items “spark joy” in their lives. If they do, you keep as many things as you want. If they don’t, you thank them for the role they’ve played in your life and let go of them as part of a decluttering process. WHAT IF: She applied the KonMari method to the important decisions local teams have to make about their rosters? MK: Paul, tell me why I’m here. PF: Marie, I inherited a team with a lot of decent-to-good players but not a lot of great ones. This team has been decent-to-good for a long time but never great. I’m really having a hard time deciding what to do — which players should stay and which players should go. MK: I see. First, what I want you to do is take all your forwards, defensemen and goalies and put them in separate piles. MK: No, figuratively. Good, now that you’ve done that, I need you to go through each player one by one and ask a simple question: Does this player continue to spark joy in my life? The important thing to remember is that you don’t have to get rid of anyone as long as they spark joy. PF: Well, see, that’s the problem. A lot of them spark joy sometimes, and then other times they don’t. And then there are some players I couldn’t get rid of even if I wanted to. MK: Interesting. Tell me more about the second part. A lot of people feel that way as they begin the process, but then they realize it feels good to let go. PF: No, like it’s against the rules of their contracts. They can’t be traded. I’m not saying I would want to trade them necessarily, but it’s not even an option. Imagine having a shirt for more than six years … and knowing that you’re going to have it for six more, no matter what. MK: In these cases, it’s most important to focus on the things you can control. And it sounds to me like you might need a little more time. I can squeeze you into my schedule again in mid-June, and we’ll need to make some tougher decisions by then. MK: I’ll start with you, Mike. What about football sparks joy to you? MZ: Complementary football. Running the ball well on offense. Controlling the clock. Flipping field position with efficiency and good punt coverage. A nasty defense. Scoring 21 points and winning. RS: Winning without killing the salary cap. Drafting and developing long-term players. Trying to bring this franchise the Super Bowl it deserves. MK: What about a consistently good offensive line? RS and MZ, in unison: I wouldn’t know. MK: Well, here’s what I know. This roster needs tidying up. And even though your lines of thinking might not be on parallel tracks, your futures are very much tied to each other. And you both need to be happy. 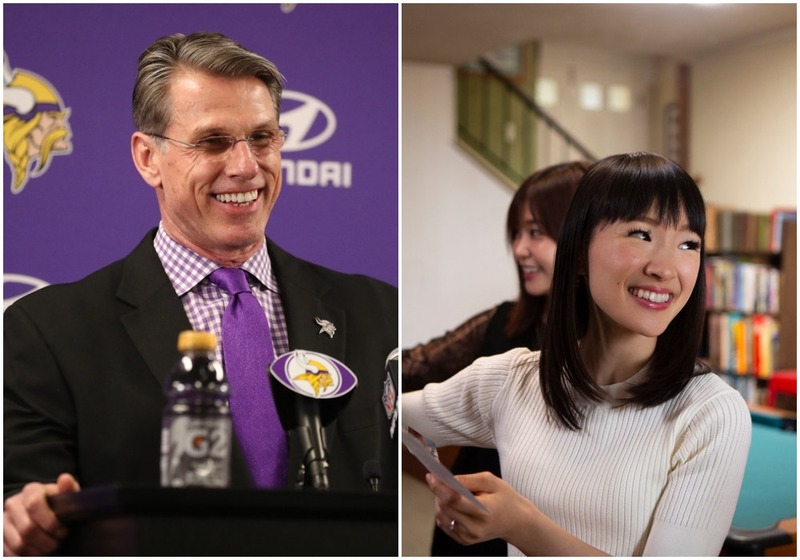 This is how I propose you spark joy: Mike, you get to keep both Anthony Barr and Sheldon Richardson. But that’s it. No more first-round cornerbacks. Coach the guys you have into a top-five defense. Rick, you need to hit a home run in the draft. Choose an offensive lineman in the first round. It will spark joy, I promise. Use another high pick on a lineman. Find low-cost help in free agency. Do your jobs as well as you’ve ever done them in 2019, or else someone else might be figuring out what sparks joy. MK: Tell me about your team. DF: Well, we won 78 games last year and didn’t get a lot of help from the free agents we signed. Luckily, a lot of them were on one-year contracts, so we don’t still have them. Unfortunately, the fact that they were on one-year contracts might have contributed to their poor performances. They did not spark joy. MK: Good, so you know what to avoid. And you didn’t repeat the mistake this year? TL: Well … we did sign a lot of guys to one-year deals. But it’s going to be different this time. Actually, if you look at it our roster is pretty well set. There have been some complaints about our lower payroll, but we want to give our young players a chance to play next to some of these short-term veterans. MK: OK, so it sounds like you don’t really need my help. DF: Well … there is one player we aren’t sure about. He played really well for us last season, and he wouldn’t cost much money, but we’re not sure if we should keep him on the team. MK: I’m sensing the problem. As you visualize him, does he spark joy? My guess is he doesn’t, but I don’t want to be presumptuous. TL: Marie, he sparks SO MUCH joy. The fans love him. His teammates love him. Even his name, Willians, is lovable. MK: I think you just answered your own question. You must keep this Willians fellow. SL: Oh, you must not have followed the NBA news. Tom was fired a few weeks ago. MK: I see. Well a good part of the tidying up has begun. He did not spark joy? SL: I really shouldn’t answer that. But playing for the new coach, Ryan, seems to be sparking some joy in our players. I’m just not sure if it’s temporary or not. We have a lot of long-term questions to answer, but not a lot of stakeholders who are guaranteed to be here for a long time. MK: It sounds like there are pressures of time? SL: Well, the trade deadline is a couple weeks away. We have a lot of guys we could move if we decide to go that route. MK: I need to ask you to put all those players into a pile, in your mind. And ask yourself: Does this player spark joy? SL: There’s a point guard. He’s pretty young still, and he’s a local legend. He sparks joy. MK: You should keep that point guard. You remember what happened the last time you traded a point guard who sparked joy. Some fans never forgave Tom. SL: *wipes away tears* Oh, Ricky. MK: Cheryl, are you OK? CR: Yes, yes. It’s just been a weird year. For seven years everything was about as great as it could be. But the last year was tough. One player who sparked joy retired. Some others are contemplating their futures. I just don’t know if it’s time to make big changes. MK: Does your team still spark joy? MK: Remember that with my method you don’t have to get rid of anything or anybody. You’ll know when the time is right if they no longer spark joy. MK: Hello gentlemen. How can I help you? ML: Well … this is probably a problem you’re not used to, but we’re not really trying to get rid of things. We’re trying to add things. Imagine someone getting a big promotion, and then finally having enough money to move from a small apartment into their own big house. That’s kind of what we’re doing. MK: I understand. I just want to caution you. You still need to make sure that the things you can afford — players, in your case — spark joy. I don’t want to come back here in August and find your field cluttered with what you didn’t really want. AH: Not giving up a million goals would spark joy for me. MK: Well that’s a good place to start.